The thing about books is that once they start to accumulate, they take up space. Here are three alternatives to consider the next time that happens instead of throwing them away. Mike Chu founded BookUp - an online platform that connects buyers to sellers - to help book owners gain back a portion of what they paid while allowing avid readers to gain access to affordable books. “We are more towards helping both ends of the spectrum rather than getting every single cent out from our buyers,” Chu said. making reading an inexpensive hobby. A fee of 30% is taken from the buyer only when the books are sold. This fee covers the entire process from warehousing, marketing, sales, packaging and delivery to the buyer. “Our business makes it easy for people to buy books at the comfort of their own house, at a price that won’t hurt their wallets. At the same time, our business helps sellers get rid of their books, without them getting out of their house as well,” he added. 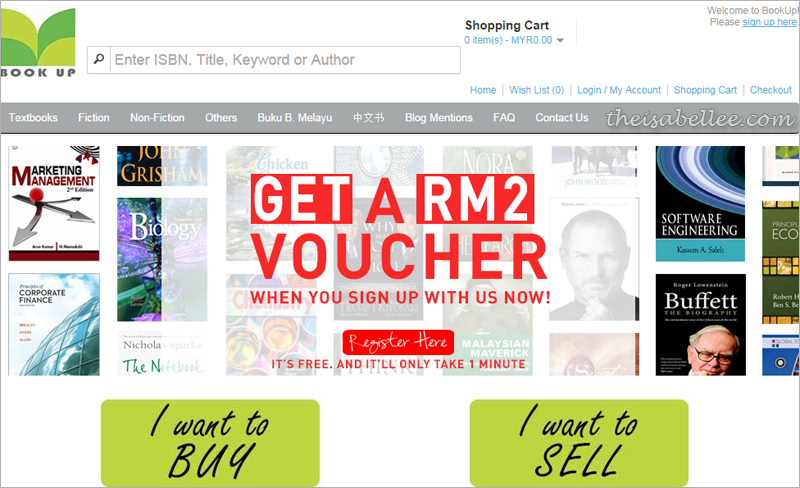 By being online, buyers are able to purchase books from different corners of the country with a click of their mouse. They can also browse the array of books easily using the title, author or ISBN. The collection at BookUp consists of cookbooks, music books and many others as well. The books are available in English, Mandarin and Bahasa Melayu. Many people from all over Klang Valley attend the biweekly Book Exchange Programme (BEP). There are visitors from Kota Damansara, Klang and even as far as Cheras. The programme is run by volunteers such as Sulyn, who spends her free weekends there. “About 100 books get exchanged at each session on average,” Sulyn said when asked about the BEP, where people can drop off a book in exchange for another. She said about 90% of the books at SJBEP are in English with a bulk of them being fiction books while there are smaller sections dedicated specially for Bahasa Melayu and Mandarin books. The cabin does not contain academic books as there is little demand for them. “We have limited space in the cabin so we can only devote shelf space to popular genres such as fiction, non-fiction and children's literature," Sulyn said. The SJBEP experience is unique because there are no fees, no deadlines to return books and no commitment. “It’s a great place to try different kinds of books because if you end up not liking a book, at least you didn’t spend RM40 on it,” Sulyn said. you may stumble upon at each book exchange. The SJBEP is held on the first and third Sundays of the month, from 3pm to 5pm, at USJ 12/2F, Subang Jaya. However, their sessions may vary according to availability of volunteers so it is best to check their Facebook page (www.facebook.com/sjusjbep). 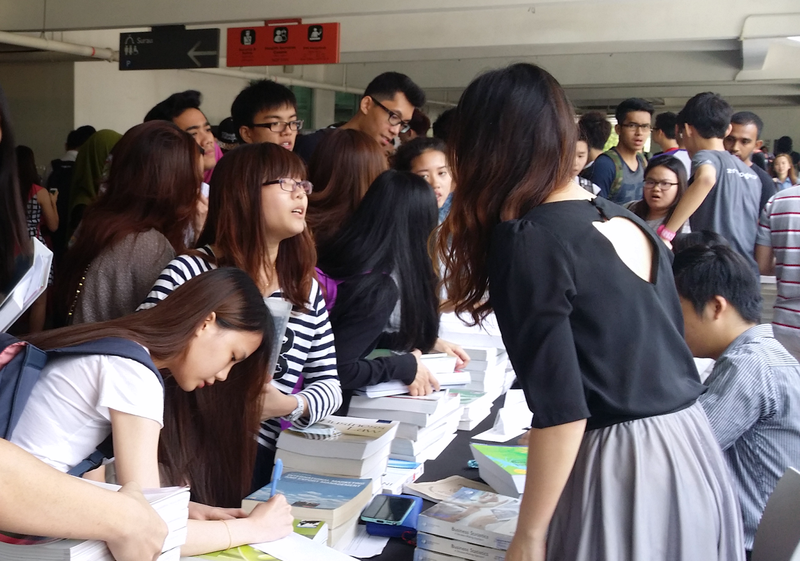 Taylor's University students crowding around the Spartext booth to buy textbooks. Spartext is held by the Taylor’s University Entrepreneurship and Investment Club to fulfill the demand for secondhand books. Spartext project manager Tee Yeu Sin said the project is based on their belief that entrepreneurship is meant to solve problems and contribute to the society. “We have a consignment agreement with those who want to sell the books and sell them to juniors,” Tee said as he described the process. About 70% of the books find new owners at each session. Although they do charge RM5 for their services, Tee said they do not hike up the price just to earn money. they do not cater to the other schools. Spartext is held twice a year at the start of semesters for Taylor’s University business students.